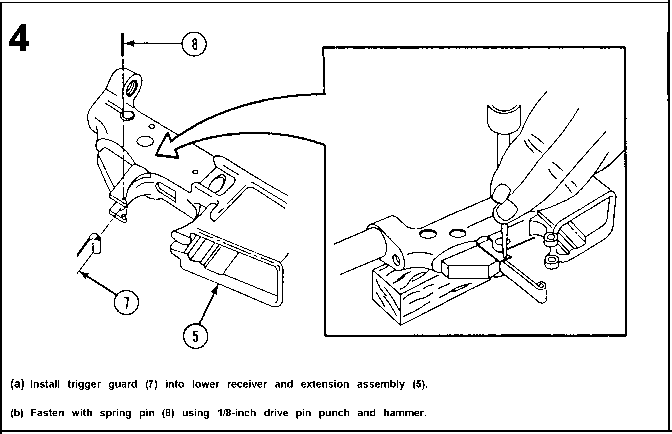 if the 'lower receiver is not disassembled, visual'iy inspect for broken or damaged parts, and insure that the hammer and trigger springs are correctly installed before beginning this test. It is not necessary to disassemble the lower receiver for the sole purpose of this visual inspection. If broken or damaged parts are found, disassemble (p 3-50) and repair as authorized. 5. Test two hammer pin holes and two trigger pin holes using not-go plug gage (1) P/N 12006472. This test may be conducted by disassembly of the lower receiver (p 3-50) or by pushing the pin far enough to disengage the end of the pin from the side of the receiver which is being tested. If the lower receiver is not disassembled and the not-go plug gage enters any hole to first shoulder (A) the lower receiver must be disassembled and all four holes must be tested again. 6. Gently insert the not-go plug gage and rotate it 180 degrees. If the no-go plug gage passes through any of the four pin holes, the rifle is unserviceable and will be turned in for replacement. The gage must penetrate through the wall thickness to be unserviceable.